This article is 559 days old. The Belle River Wind power facility is up and running. The 100-megawatt facility is expected to generate enough clean energy to power approximately 35,000 Ontario homes each year, based on average annual residential energy use in Ontario. The facility will create 12 permanent positions during operations. Towers for the 40 Siemens 3.2 MW wind turbines were made at CS Wind’s manufacturing facility in Windsor using Ontario steel. The 120 turbine blades were manufactured in Tillsonburg. 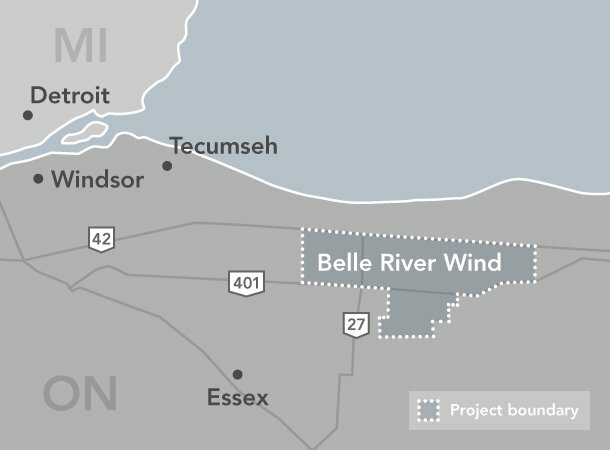 Belle River Wind is said to bring more than $2.5 million in direct spending over 20 years in property taxes and landowner lease royalties. In addition, Belle River Wind committed $6 million to the community of Lakeshore as part of a long-term Community Benefit Program, which supports education and other initiatives. This includes an initial contribution of $2 million and an annual contribution of $200,000 for the next 20 years.